Access Not Denied! : Mutual Funds Versus Indvidual Stocks....and the Winner is? Mutual Funds Versus Indvidual Stocks....and the Winner is? Anyone who knows me personally knows that I invest in the stock market, but what many people do not know is what the stock market means to me. I started to write articles to try to encourage people to invest in stocks, but I know that the average person regularly invests in mutual funds. I get it, individual stocks are "scary" and you can supposedly lose all your money,etc and don't get me wrong, investing in mutual funds is a better way to go than keeping your money in the bank (interest rates anyone? ), but I am here to tell you that investing in individual stocks can be done safely and can give you returns that mutual funds can only dream of. 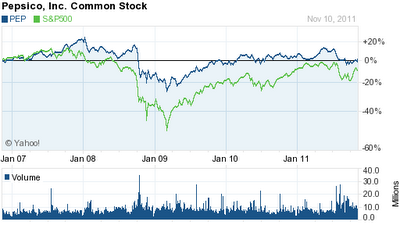 Above is a chart of Pepsico (PEP) compared to the S&P 500 for the last five years, please take a long look at it. Did you take a long look? Good, now allow me to explain what Pepsico does, I know, I know, but just in case there are people out there who have been living on a dessert island for 90 years I might as well explain what the company is all about. Pepsico manufactures, markets, and sells food, snacks, non-carbonated and carbonated beverages across the globe. Some of the brands that are part of the company consist of Pepsi, Gatorade, Tropicana, Doritos, and Quaker Oats. According to Yahoo!, Pepsico has a market cap of of almost $100 billion with revenues of close to $65 billion. Pepsico also sports a yield over 3%. As for the S&P 500, it consist of a basket of the largest companies in the world and it has a yield of about 2%. When we look at this chart we can see that over the period of five years (a period that includes a major recession) Pepsico beats the S&P and this chart is not including dividends, if we did include dividends Pepsico's graph would look even better. So how bad did Pepsico beat the index? Pepsico returned +.66% vs. the S&P's return of -10.2% and mind you this is not including dividends. I know what everyone is thinking, Why don't I compare a mutual fund to Pepsico instead of the S&P? Good question, and the reason is because the S&P beats over 70% of all mutual funds. I want to conclude this article by saying that I could have picked many great companies, but I chose Pepsico because of its portfolio of brand names. I believe that anyone can learn how to find quality stocks and easily beat the returns of the majority of mutual funds out there in the investing universe. Do not be afraid of individual stocks, take a look at my resources and websites page, read and learn and you will become a better than average investor. Good Luck.